Balancing Jane: My Kid Doesn't Watch TV; Give Me My Parenting Gold Star! My Kid Doesn't Watch TV; Give Me My Parenting Gold Star! As you are probably aware, Viacom and DirectTV are in a dispute that has left many without access to their beloved shows. (It even impacts satellite/cable cutters like me because Viacom has pulled their free online content like streaming episodes of The Daily Show). This isn't a post about who's right. I don't know who's right, but I suspect they'll sort it out soon as I imagine they both want to make money. This is a post about kids, TV, and the way that we think of kids and TV. See, if you depend on public opinion, allowing your child to even be in the same house as a television is tantamount to removing sections of their brains, putting them in the blender, and then carefully replacing them. If you dare to allow your child to watch a full-length half-hour kid's show, then you might as well dump them out in a barren tundra slathered in some wolf-attracting gravy, because at least then they'd have a fighting chance. Obviously, I think that these criticisms are a little ridiculous. For one, I don't think that a little exposure to electronic media is going to ruin our children's brains. In fact--as I've talked about before--I think that some media exposure is important because we live in a world where navigating complex media is an important part of our lives. Our children are going to grow into adults, and being able to analyze media--especially media that's trying to sell them something--will be important. This is especially true considering the technological advancements that will occur between now and our children's adulthoods. We can't possibly predict what their media landscapes will look like, but we can start to think about broad-level skills (like critical thinking) that will be applicable in any situation. At the same time, I don't let my daughter watch television. This doesn't mean that I won't ever let her watch television, but I'm trying really hard to ensure that her media is introduced appropriately, and--for me--that means depending largely on media like books and music until her cognitive maturity is more developed and able to process dynamic media like television. But I'm afraid that saying "I don't let my daughter watch television" will get me labeled as being someone in that first camp. And I don't think I belong there. How Much TV Can Kids Really Be Watching, Anyway? Oh. That's a Lot. And the thing is, there's more than a grain of truth to these concerns. Kids watch way too much TV these days. (Check out the Kaiser Family Foundation report from 2010 that looks at how many hours 8-18 year olds spend with media and this similar report from the Sesame Foundation that looks at the media habits of even younger children). And if the comments were targeted in that way, maybe I wouldn't bristle so much. But they just seem so . . . smug. Take a look at them (and these weren't really chosen for their representativeness so much as their closeness to the top. Comment after comment reflects the same sentiment.) Kids who watch TV aren't being read to (because clearly you have to make a choice between television and books. It's one or the other. That's how media works). Kids who watch TV are "brats." Then there are the parents who are bragging about how their kids fall outside of the norm. "My kids don't care." "My 4 year old doesn't even know that Nickelodeon is gone yet." These parents are so proud of their decision to spend every waking moment reading to their kids and playing games instead of watching television that they had to take to the internet to rub it in someone else's (someone who is clearly neglecting their children's) face. Maybe There's a Real Problem, But Is Shame the Way to Fix It? And I think that's a problem. If you take a look at those reports from the Kaiser Family and Sesame Foundation, it's very clear that most children are watching some TV--and a lot of children are watching too much TV. Does allowing the minority of people who make a decision not to allow their children to watch TV climb up on a very vocal pedestal make the conversation surrounding children's media consumption easier? I think not. In fact, I think that allowing this vocal minority to shame and patronize parents for making a different choice about media consumption shuts down avenues to important conversations about how to incorporate appropriate media, in terms of both content and amount. So instead of having constructive discussions over whether the messages about gender and race are appropriate for children or important conversations about how to balance sedentary hobbies with more active ones, we just turn into screaming defensive masses protecting our "no-TV" or "TV" turf. Furthermore, it's really just one more battlefront in the I'm-a-better-parent-than-you game. Whether it's how we feed our children, where they sleep, whether we stay home with them or send them to daycare, whether we send them to daycare or hire a nanny, whether we wear them or use a stroller . . . you get the picture. It's always easy to pick the choice that you feel really good about and use it to look down upon everyone else. But none of us gets it 100% right 100% of the time, and turning every parenting decision into a do-or-die battle makes it really difficult for us to learn from one another and make decisions informed through multiple perspectives. "It's always easy to pick the choice that you feel really good about and use it to look down upon everyone else." That's exactly it. This is something I noticed in my earliest days of parenthood; that parents who make one decision tend to get so defensive about it that they look down upon anyone who makes a different decision. I think it's an insecurity thing: "If I made this decision and someone else made a different decision, then maybe I'm wrong..."
Look. I let my kids watch TV. But we watch it interactively. My 3 1/2-year old says, during every episode of "Mickey Mouse Clubhouse," "Mouskatools isn't a word. It's a pretend word we only say with Mickey Mouse." Because I'm teaching him that made-up language for marketing's sake is not real language. I also point out things like, "Look, that Mommy is doing laundry, but in our house Daddy does the laundry," and "Not all girls like to be princesses." And you know what? My son also listens to books, plays by himself, plays outside, goes to swimming classes, and can count to 20 in both English and Spanish. My point is, TV can be a teaching tool: for smart media consumption, for critical gender studies, and for many other things. As you said, these days it's actually important to teach our kids how media works. P.S. I know plenty of people who don't own TVs or claim they don't let their kids watch TV...but they do let their kids watch shows on the computer, or look at YouTube videos. That's a great point. We don't have cable or satellite, and I think sometimes people think I'm being sanctimonious when I say that, but--trust me--we get PLENTY of pop culture fixes without it. Hahaha yes I was going to say exactly the same! Although I do think there is something to be said for watching particular clips or DVDs that don't have ads.. I understand there is some research that has shown exposure to advertising to be one of the most negative impacts of tv watching? Also, Jane your kid is still aged under 2 right? So really you're not one or the other yet, surely, but just paying attention to the paediatrician people? Yep. She's only 20 months, so it's still easy at this point. I know it's going to be more difficult as she gets older, and I know that she'll watch some TV. Some of these studies show children under a year getting quite a bit of screen time every day, though. There are even iPhone apps aimed at babies. We mostly watch shows on channels without "real" commercials - Disney Junior and Nick Junior both only have commercials for their own shows. But even when I leave HGTV on for myself, we talk about the commercials and how they are trying to make us want something we don't really want or need. My 3 1/2-year old and I say, "You're not the boss of me, TV!" I'm trying to teach him that TV-watching can be interactive, not passive, and that he controls the TV and not the other way around. In other words, it's a completely false and gross overgeneralization for the people in those comments you pointed out to say all tv=bad. "You're not the boss of me, TV!" I love it! My kids watch TV. Probably too much TV. I'm always pushing and pulling against it, but ultimately, I think some TV is fine, especially if you use it to discuss media awareness. I love TV, so do my kids: I know we have a tendency to overwatch and I resist that as much as I can. When we visit friends/family with cable, we talk about the difference between shows and commercials, and analyze how commercials how to trick you. A huge theme on our blog is finding good shows to watch with kids, since Jen and I have given up on NOT watching shows with them. 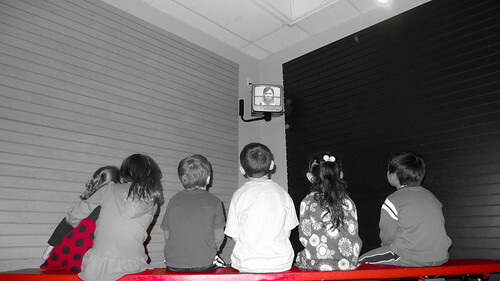 But the straight line between kids watching tv to bad parent (or kids never watch tv to GOOD parent) is pretty foolish. There are lots of caring parents who take their kids to swim lessons and friends' houses, who then queue up Swiss Family Robinson in the late afternoon while they prep dinner and everyone cools off. There are plenty of indifferent and lousy parents who never allow their kids to watch TV but still don't interact or play with their kids, or whatever. It's not so simple. I love TV, too, and there are entire subsections of pop culture that I can't wait to share with my daughter when she's old enough. I don't think that watching TV has turned my brain to mush, and I do think that it has the potential to connect us to ideas (and fun) beyond our own limited experiences. I don't want to cut her off from that. My husband and I were just talking about this yesterday in how to both limit the amount of exposure to media and to teach our future children (God willing) how to be media literate. Our parents could not have predicted the rise in mass media, internet, conglomerates, etc. and I think we can't really know the future, as you said, for the next generation in terms of media. I think this is just another example of parents feeling insecure in their choices and the sacrifices we all have to make in order to justify some semblance of security and pride, even if it's not a situation that should warrant it -- as in "my kids NEVER watch TV!!" versus "my kids watch TV sometimes and we talk about what they are viewing" versus "my kids watch TV all the time."